By water, the Sciencenter of Ithaca, New York, is 1,500 km (932 miles) from the Atlantic Ocean. But we know that trash and other pollutants dropped into the stream next to our museum will eventually end up in the ocean. So, for many years, we have offered a feature educational program on ocean conservation called “Connect to the Ocean.” It features dozens of school field trip programs on ocean conservation annually, a saltwater tide-pool touch tank, and a mini-submersible environment with underwater videography of the flora and fauna at seven stations. Participants follow along on water’s journey from Ithaca to the Great Lakes, down the St. Lawrence River, and then out to the Atlantic Ocean, all produced by award-winning videographer David Brown. 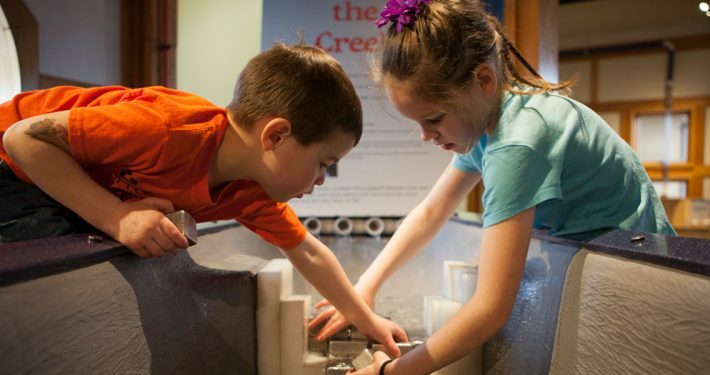 In recognition of the first International Science Center & Science Museum Day, November 10, 2016, the Sciencenter will provide special programming and extended hours for its entire Brooks Family Ocean Education Gallery. Museum educators and volunteers will provide multiple opportunities for museum guests to handle and learn about ocean creatures, see animals that are rarely seen at the shore, and discover the importance of taking care of their own inland watershed, which is directly connected to waterways downstream, all the way to the ocean.